The Purple Scarf: Explore Toronto: Serenity Now! Sometimes I find it hard to get some peace and feel grounded living downtown in North America's fourth largest city. I love Toronto and it is my favourite city in the world, but sometimes a girl has just got to get away! 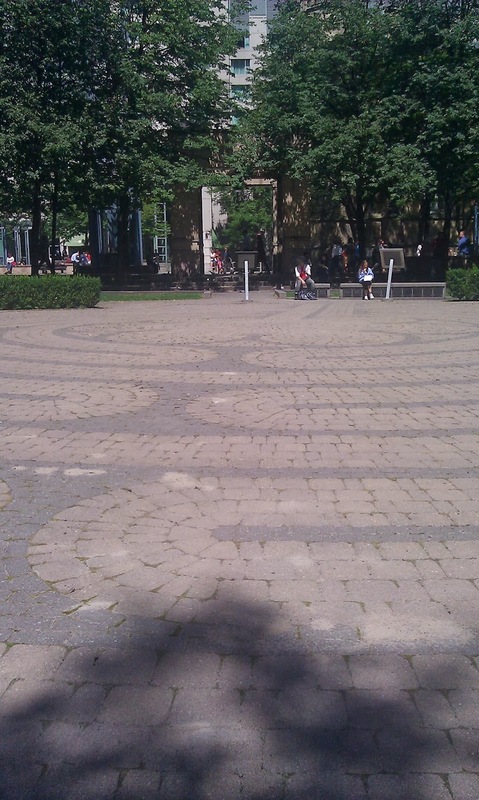 If I don't have the time or the means to leave the city for a weekend, I find myself walking the winding path of The Toronto Public Labyrinth downtown in the heart of Toronto. 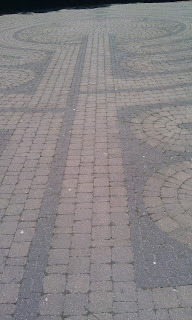 I walk the pathway towards the centre, just letting my mind empty of all the worries and questions that have been bothering me that week. 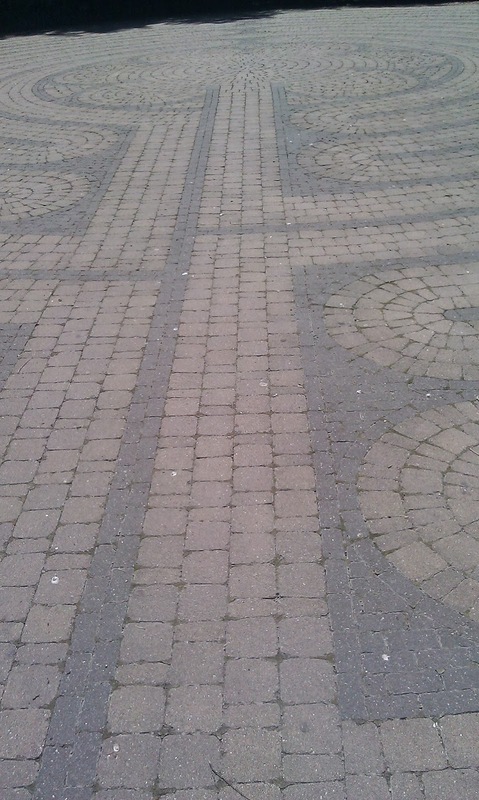 Once I reach the centre, I just stand there and take deep breaths, feeling myself calm and content. 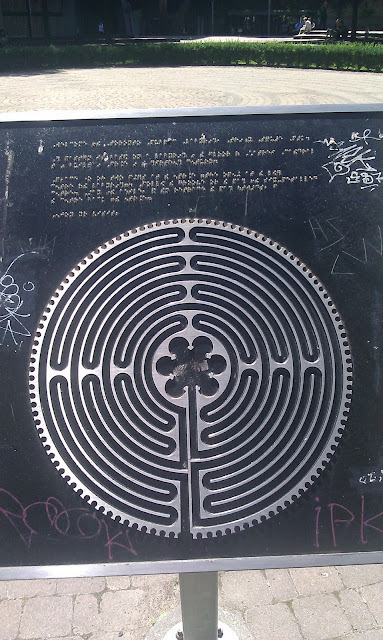 Once I follow the path out and reach the end of the Labyrinth, I feel like a weight has been lifted off my shoulders, more happy and able to see things with a better perspective. 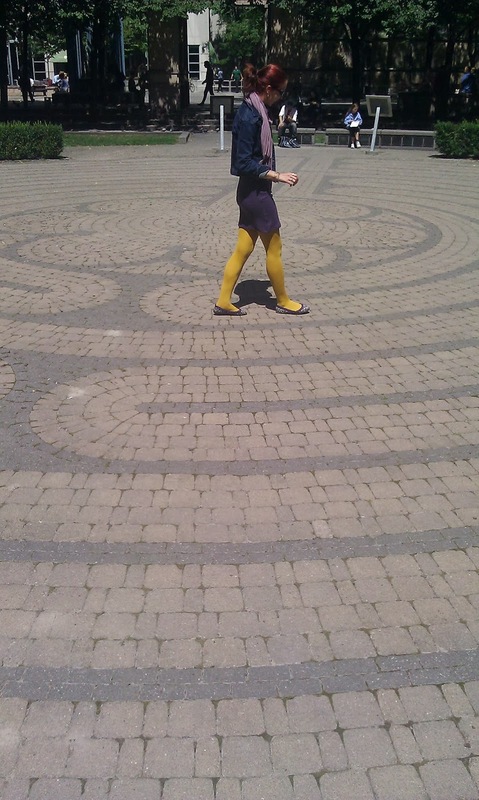 There are many reasons in the past Labyrinths were built, but there has been a resurgence of Labyrinths being constructed and walked across Canada and across the World, and for more healthier reasons. 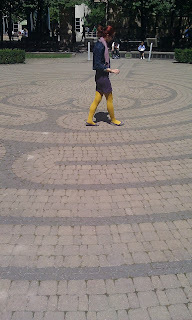 For centuries, Labyrinth walking has been done for meditative purposes. It helps support a feeling of calm and peace, while giving a person a place and time for reflection. Recently, Labyrinths have been built around hospitals to provide patients a place where they can help gain physical and mental strength and stability. The Toronto Public Labyrinth is located in Trinity Square, between The Toronto Eaton Centre and Bay Street. It officially opened September 14, 2005, and replaced a grass labyrinth that opened July 2000. 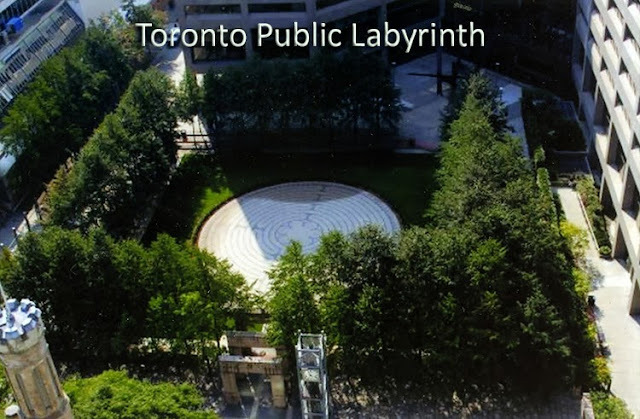 The Toronto Public Labyrinth is always open and is lighted in the evening. It is wheelchair accessible and there is a Braille sign nearby. For more information on The Toronto Public Labyrinth or other Ontario Labyrinths please visit The Labyrinth Community Network at www.labyrinthnetwork.ca. 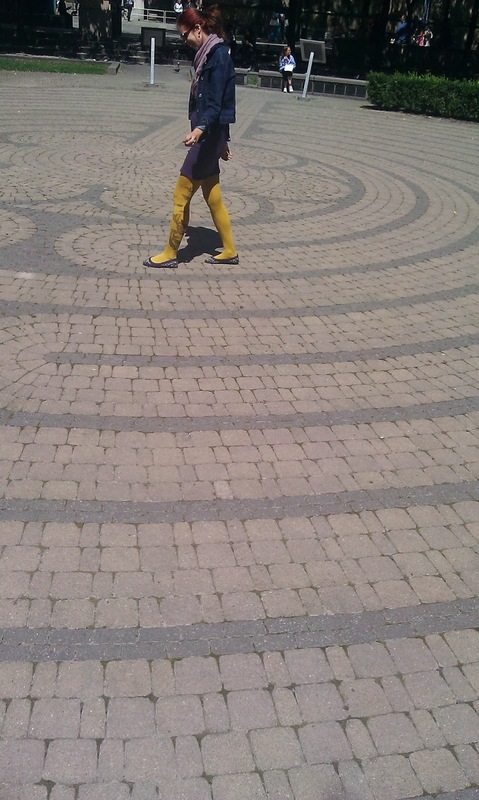 So if you every need a vacation from the hectic, and sometimes stressful city life, take a walk on the calm side and, enjoy The Toronto Public Labyrinth. It may change your life! P.s! : there are several special walks throughout the year, with music, on the Spring and Fall Equinox, and the Summer and Winter Solstice. There are also special events and presentations held through out the year. Please check The Labyrinth Community Network site for more information.